Animals’ Angels has been documenting conditions at the Knoxville Horse Auction for quite some time. On February 25, 2017, investigators arrived at the sale at 2:20 pm. It was a very busy sale day and the parking lot was already overflowing upon our arrival. Well known horse trader Jenkins’ Horse & Mules from Virginia was parked in the side parking lot, pulling a farm use trailer with no license plate. He also had no DOT number displayed, which is a clear violation of Federal Motor Carrier Regulations. AA has reported these violations to the appropriate authorities. 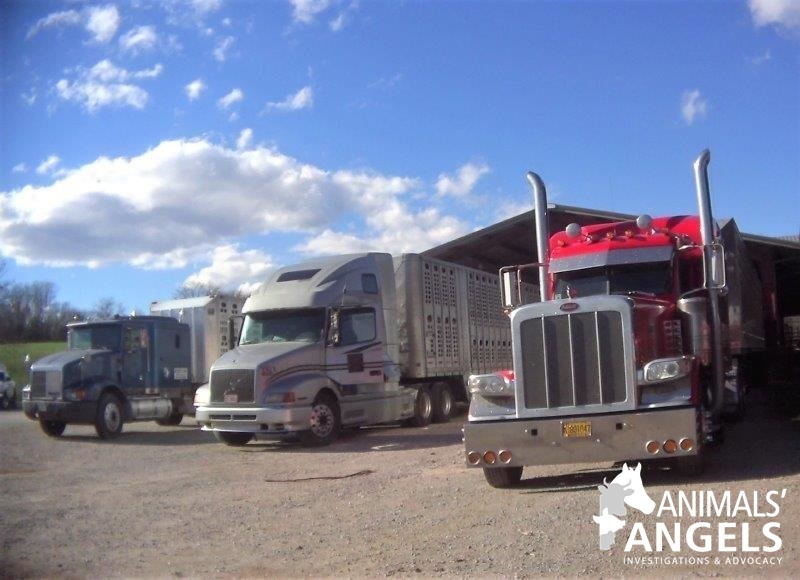 At the back of the barn, investigators observed the trucks and single deck trailers of the Stanley Brothers, kill buyers from Arkansas, and Meyers Farms, who are from Kentucky, were already backed up to the loading ramps. The Stanley Brothers, who run the notorious slaughter horse kill pen in Bastrop, LA, made international news in 2016 when the feedlot owner’s son and another individual cut a dog’s throat and then posted the cruel act on social media. 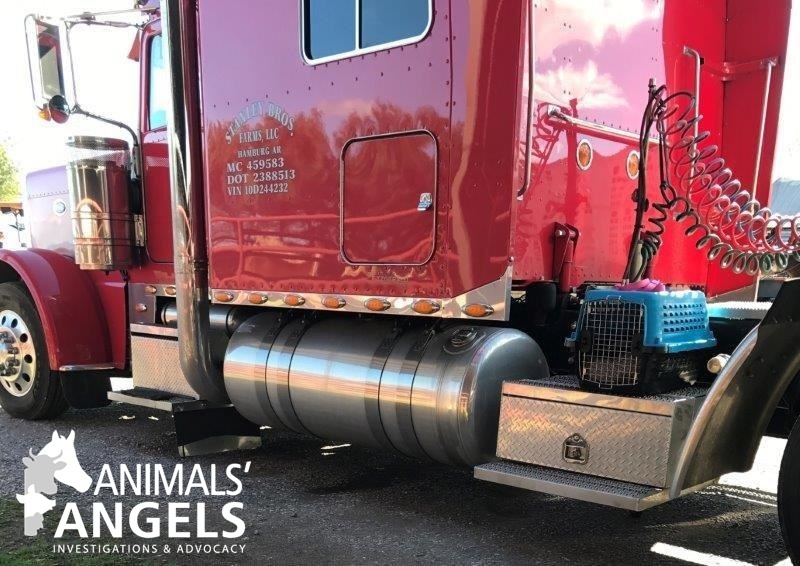 Investigators were shocked to see that despite the pending felony cruelty charges, the kill buyer apparently had decided to obtain yet another helpless animal: a dog crate with a very small puppy was spotted sitting on the kill buyer’s truck. A pink leash was laying on top of the crate. After continuing their observations in the pen area, our investigators noted that, once again, the vast majority of the horses sold at the sale were sold as “loose” and were definitely slaughter prospects. 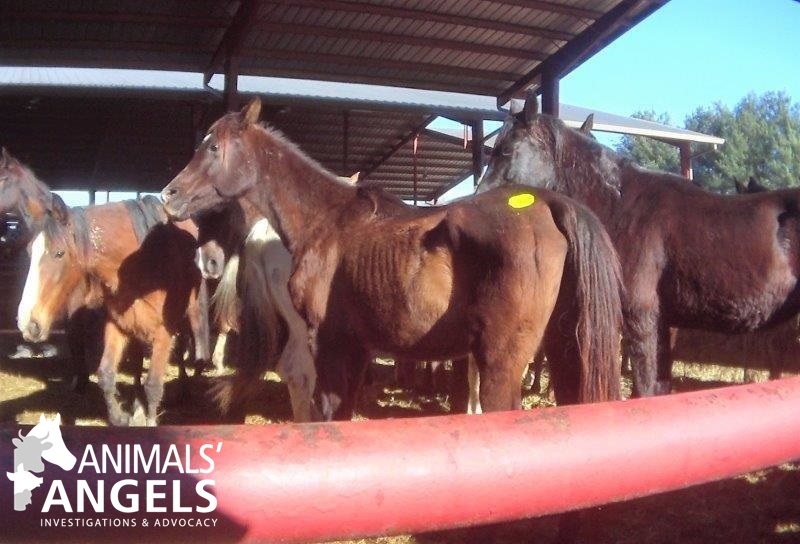 Many of the horses were emaciated with overgrown hooves and bur coated manes and tails. Several horses were covered in old and new scars. Others had eye infections or were coughing and had snotty noses which could indicate an ongoing Strangles infection. 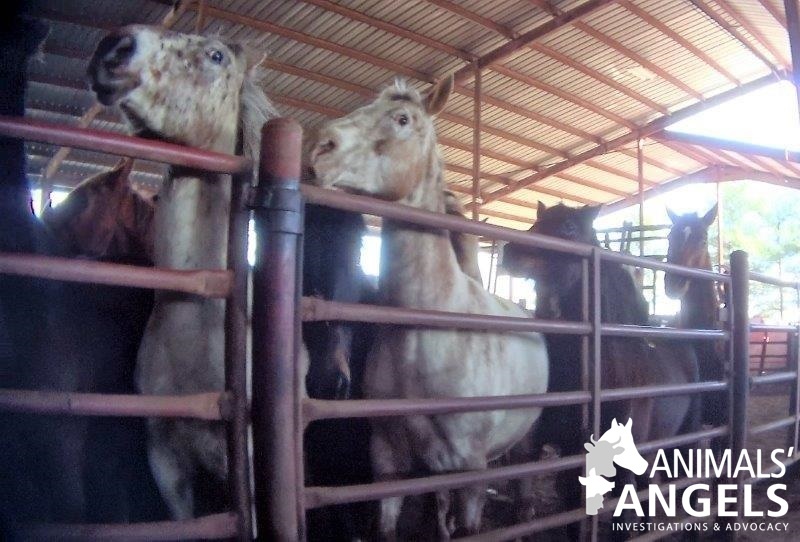 As has been noted in previous investigations, auction employees paid no attention to the temperament of the horses, and aggressive horses were placed in large pens together with 15+ other animals, creating chaos within the pen, with immediate kicking and biting. The handling of the animals was among the worst observed by our investigators, especially at the scale. Panicked horses were forced through the narrow scale by workers with the use of excessive hitting. Each animal’s blood was drawn and then they were released carelessly into an adjacent pen. Auction workers were observed striking the horses located at the back of the pen countless times with their flags for no apparent reason, pushing them towards the other horses at the front of the pen, who in turn had no place to go. The end result was complete mayhem. One horse tried to climb the pen railing in desperation, and another horse went down in the process and was trampled by others. Luckily, the poor animal was able to regain his footing, his injuries unclear due to the disordered activity. The horses remained extremely agitated and continued to kick and bite inside the pen. Finally, a female worker moved the entire group to a larger pen, cursing the horses out as she did so, while also continuously beating an emaciated mare with a flag, callously striking the horse’s exposed spinal cord throughout every step she took. At 3:45 pm, another tractor trailer with a double deck trailer (modified to serve as a single deck) backed up to the loading ramp. This truck, with the name “Luck’s Farm” displayed on the door, was from North Carolina, but had no DOT number. A quick search of Federal Motor Carrier records showed that the name was not known in the system either. Both are clear violations of the Federal Motor Carrier Safety Regulations, which we have reported to the appropriate authorities. The horse sale started at 4:00 pm and began with the riding horses. The auctioneer took a great deal of time to advertise each of the animals in this category. However, this changed when the slaughter prospects were moved through, with each “loose” horse being sold in a matter of seconds. All the kill buyers present secured multiple loads. 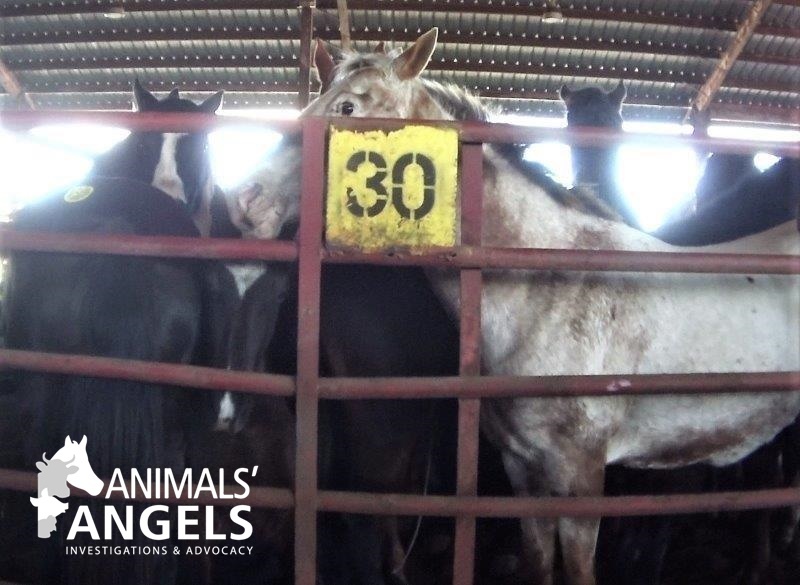 This investigation shows yet again that the Knoxville Horse Auction continues to be one of the main slaughter sales in the country and worse, that conditions remain extremely poor. AA will continue to monitor the situation. All violations observed have been reported to the appropriate authorities as we continue to push for legal action.